Why does this dishtable need to be welded together once I receive it? Due to the overall size of this item, it must be shipped in two pieces; to complete assembly, it must be welded together in the field. It will arrive with a seam that has been prepared for field-welding. 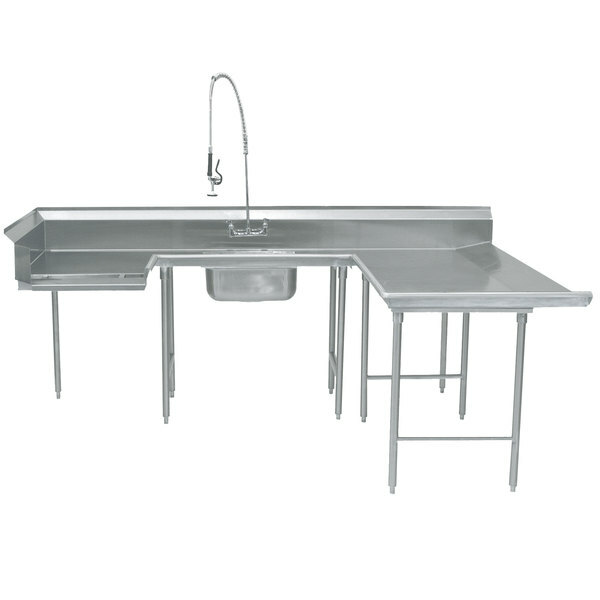 Improve efficiency in your dish room with this Advance Tabco DTS-U30-132 132" stainless steel U-shaped soil dishtable! This dishtable features a rugged 14 gauge stainless steel construction and 8" deep sink bowl as well as a 10 1/2" backsplash with 2" return and tile edge to protect your walls. The backsplash has holes punched on 8" centers to accommodate a faucet (sold separately), while 1 5/8" diameter stainless steel legs with welded cross bracing provide support for the whole table. Additionally, its stainless steel gussets are welded to a support channel for added reliability, and all welds are blended with the surrounding surfaces for a clean presentation. Due to the size of this item, it will be shipped in two pieces and must be welded together to complete assembly.